We offer the best choice from 6 standard-sized units and 3 climate-controlled units to boat and RV storage to accommodate different needs and different budgets. Hood River offers so much to offer in terms of recreation, which is why Secure Storage provides so many options for storage in the Hood River area. Whether you need space to store your outdoor gear, RV, boat, or household items, we have all the options. Secure Storage offers so multiple unit sizes and prices to match your storage needs while also fitting your budget. We provide sizes from mini storage to large vehicle spaces, such as for RVs. Our unit sizes go from 5x10 to 10x30 with corresponding prices. In addition, we also offer 12x30 and 12x40 storage spaces perfect for cars, RVs, or boats. Our smaller spaces are great for small household items and our larger spaces provide ample space for storing furniture and other large items. A 5x10 storage unit is 50 square feet of space. A 5x10 can be considered a mini storage unit. Mini storage is best for small or medium sized bedrooms, such as a studio apartment or dorm room. 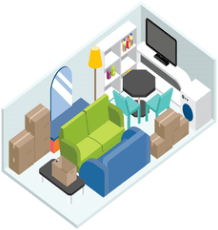 A 10x10 unit is 100 square feet and is perfect for a one-bedroom apartment (not including large appliances) or two smaller bedrooms worth of items. A 10x15 unit is 150 square feet. These units can hold up to three bedrooms’ worth of belongings, or the entire contents of a one-bedroom apartment. The 10x15 size unit is often a popular choice for business storage. They are great for storing office supplies, seasonal decorations, and promotional/event booth materials. A 10x20 or 10x25 unit is about 200 square feet of space. 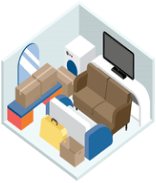 These units can fit the contents of a two-bedroom home with additional appliances or other miscellaneous items. Since they are also roughly the same size as a one-car garage, they are also a great option for car storage or even ATV storage. A 10x30 unit is 300 square feet. 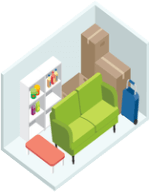 Being the size that it is, this size of rental space is convenient for both household and commercial storage. Our 12x30 and 12x40 storage spaces are intended to fit large vehicles, such as boats, cars, and RVs. To find the best fit for your storage needs and to find out availability, you can contact one of our on-site managers to help you find the right self-storage unit. Do you need storage in Hood River, OR? We can hold a storage unit for you! We hope you consider Secure Storage for all of your self-storage needs! Choose Secure Storage when you are looking for a storage unit in Hood River, Oregon. If you need a later start date, just contact our office manager to make arrangements. Check availability now! Very good business! Mark and Tammy were great! If I need another storage unit I would go back to them! !